I’m a conservative, and I’m also a “republican,” but I am the latter only in the sense of a lower-case “r.” I believe in the republican form of government promised in Article IV, section 4, of the US Constitution. 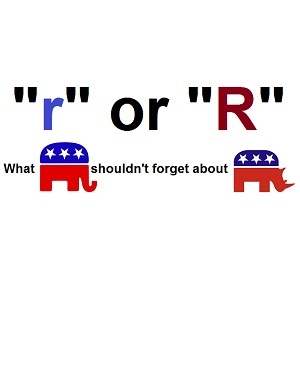 Many Republicans (members of the political party) seem to be confused about what this means, and I suppose it is only fair to make them aware of the distinctions between the things many current Republicans now advocate that violate the platform and the principles of republicanism that their party claims to uphold. Those who become confused about what it means to be a RINO (“Republican In Name Only”) need only consider the small “r” form of the word. It’s easy to fill out a voter registration card and check the box beside the word “Republican,” but it’s another matter entirely to know what is republicanism. As we debate issues of critical import to the future of the nation, it’s more important than ever that conservatives know what it is they are fighting, and what form it takes. The outcome of 2014 and 2016 will set the course of the nation for generations, and we must win it. This is the heart of the battle between the so-called RINOs and we constitutional conservatives, and it will determine our nation’s future. One of the concepts that has long been associated with republicanism is that we hold in disdain the notion of a “ruling class,” a presumptively superior elite who by virtue of some unknown mechanism somehow know better than the rest of us with respect to how we ought to be governed. Indeed, when our republic was established, it was with the experience of a people who had freed themselves from the bonds of a King, who claimed his right to rule over us by virtue of his station of birth. I do not doubt that some people are superior to others in some particular way, but nearly everybody can claim some attribute in which they are superior to most others. Some of that is a result of education, experience and training, while some of it results from pure genetic gifts. There is no gene, however, that entitles one man to rule over others. There exists no family lineage in America that can rightly claim to exercise a disproportionate power over the affairs of nations and men. We do not have kings, and while there were a few in early America who advocated for a monarchy, the broad body of the American people rejected the idea as an apostasy aimed at thwarting the very revolution in which they had only so recently succeeded. The only thing I hold in greater contempt than the man (or woman) who would claim the right to rule over me by virtue of family lineage or family station(a.k.a. “nobility”) is the poor, twisted soul who would consent to such a proposition. I am no person’s chattel, and I abhor any human being who claims membership in this species who would surrender themselves as having been of no greater significance than a possession of “better” men. Those lacking the essential self-esteem to realize that they are by right the sovereigns over their own affairs, equal to any other on the planet, ought to immediately depart these shores to seek refuge in some Kingdom as a serf. In this sense, it is fair to say that I not only reject a supposed “ruling class,” but also that I likewise hold in contempt the corollary premise of a “ruled class.” Part of the republican ideal is that classes are a subjectively-defined fraud perpetrated against a people who ought not to be willing to accept it. Why is it that so many Republicans prefer to think of Americans in a class system little different from their alleged ideological opponents, the statists? The answer is that too many Republicans are statists themselves, having rejected the fundamentals of republicanism. By what strange and mystical knowledge do the brothers Bush claim to have the better answer on the subject of immigration, both now pushing the Gang-ofTr8ors Bill? Why do so many Republicans accept their claim in the unthinking form of a command received from on high? It is because too many Republicans have either surrendered or rejected the republican principles under whose banner they march. If you listen closely enough, you can hear in their intentionally vague language the lost concepts that they will not name, never having believed in them from the outset. Although a few are now catching themselves in pursuit of the betterment of their propagandists’ art, you will invariably hear them speak of democracy as the goal and the object of their advocacy. This is not merely loose wording, but a true reflection of the form of government they seek, a form so terrible that our founders placed a stricture against it in the US constitution in the form of an endorsement of republican government. A democracy is not a form of government most rational people would want, except that they have been taught that it is the desired form. To hear a President say that he wishes to spread democracy to the Middle East is an arrow through the heart of republicanism. We have seen what democracy creates in the Middle East and throughout the Arab-speaking world. Pakistan is a democracy. Egypt is now a democracy. Libya is now a putative democracy. Iraq now is a sort of hybrid democracy, but in each of them, what you will observe is how the whole course of the nation is changed by political instabilities, and that the rule of law acts as no restraint upon political leaders in working their will. Barack Obama is intent on turning the US into a democracy, because democracy is always the precursor to despotism. Most of the worst thugs of the twentieth century came to power on a wave of popular support that defines the democratic model: He(or she) with the biggest mob wins. Even now, in Cairo, when the military perceived that President Morsi (the Muslim Brotherhood’s stooge,) no longer held sway over the largest mob, they placed him under house arrest and offered an interim president who will enjoy for at least a time some popular support. Throughout the third world, it is fair to say that most countries have adopted some form of governance that lurches repeatedly and often from some sort of feigned democracy to absolute despotism. A republican form of government is much more stable, and it has been the underlying root of our general prosperity for some two-hundred-twenty years, with a few notable exceptions, in largest measure because nearly all of the occupants of the land had accepted the orderly rule of law and the specific, constitutional methodology by which laws are to be adopted, modified, or repealed. Having a set of rules that is inflexible, particularly with respect to changing those rules, and obtaining the consent of those who must live under them for a span of two centuries is an extraordinary feat in human history. The dire flaw in all of this is that from the moment of its adoption, people begin to conspire to overthrow it in one fashion or another, by finding loopholes, imagining a “flexibility” that does not exist, inciting rebellion against it, or seizing power over it with which to subsequently ignore the mandates of the law. In American history, we have seen all of these methods employed, indeed, some of them are being employed even now, as our President conspires with his cabinet to ignore the rule of law, ignoring the plain language of the law as often and as thoroughly as they believe they can manage in a particular political context. What good is a law that those who are charged with enforcing it refuse to rise to carry it into execution? When the public officials whose job it is to see to it that subordinate officials execute the law refuse to discipline those who will not obey, always claiming as an excuse some alleged greater “public good,” what you are witnessing is the reduction of a republic to the state of a pre-despotic democracy. Many Americans who are demonstrably ignorant of the world’s history of governance believe that our Electoral College is anti-democratic, and on this basis, advocate its repeal, demanding instead to rely upon a majority (or plurality) of the popular vote. While they are correct that the Electoral College is undemocratic, their ignorance is born of an educational system that has misled them to expect majoritarian rule in all cases as the preferred model. Naturally, that same system has failed to teach them about federalism, the ninth and tenth amendments, and the whole construct that is a constitutional, representative republic, being the precise form of government the framers of the US constitution did adopt and ratify . Indeed, in a true democracy, there can be no protections of any minority but by violence. This was the great object the framers of our constitution had hoped to impede. They knew that majoritarian rule is no form of government for a peaceable, civil society, and that such governments are always ripe for manipulation by unscrupulous and demagogic usurpers. The whole purpose of all their checks and balances had been to obstruct to the degree humanly possible the sort of instability made easier by democratic rule. Their constitution set at odds every branch of government, and even divisions within branches, like the House and Senate. It relied upon a competing fight for sovereign power between the several states and the federal government, all at odds in most cases, except when the most pressing of public crises may discipline them to more affable cooperation. This was their plan, and their intention, and they hoped that in little-modified form, it could survive some severe tests that they knew would come, as they must for all nations. With the onset of the progressive era in the early twentieth century, there was a move toward greater “democratization,” that brought with it a string of constitutional amendments, causing a great unwinding of our nation. The 16th, creating an authority to tax income (and the legal establishment of a class system;) the 17th, changing the manner of election of US Senators; the 18th, instituting prohibition; the 19th finally giving women the right to full political participation all came in this era, with only one of them(the 19th) having been justifiable among civilized people, and one of them(the 18th) creating such terror that it was ultimately repealed by the 21st amendment. Progressive Republicans of that era helped to install these amendments, and none of them did more damage to the system of checks and balances the framers had invented than the 17th amendment. It effectively muted the voices of the states as sovereigns in the federal system. It did so by causing Senators to be popularly elected in their respective states, shutting out the state governments as a confounding, obstructive influence on the growth of centralized government. Our republican form of government was constructed to sub-divide government into so many competing segments and interests that it would be nearly impossible for any one interest to gain supremacy. It succeeded in many ways so long as politicians held onto the general republican ideals, for more than a century generally held by members of both parties. (It is instructive to remember that the forebears of the modern Democrat Party called themselves “Democratic Republicans” for many years before dropping the second half of their name with the ascendancy of Andrew Jackson.) It is therefore no surprise that a Democrat party would become the party of the slave-holding South, or that the Republicans would supplant the Whigs by championing the rights of an enslaved minority. Words, including even party labels, meant something distinct in those days. In the progressive era, mostly for the sake of political expediency, there were a number of Republicans who began to adopt more democratic notions of governance, including the predisposition of their Democrat brethren to an elitist view of a class system not only in the general populace, but also among political offices and those who occupied them. The influences of corporations grew, as did the corrupting influence of gangsters during prohibition. From that era arose an establishment of Republicans who were nothing of the sort, and with few exceptions, have managed to maintain a fairly strong control over that party, most often as the minority party. Viewed in this fashion, it could be said rightly that the Republican Party has been charged with managing the real republicans into submission. Who are the real advocates of republicanism in the Republican Party? Nowadays, we call them “conservatives,” although they are actually the philosophical heirs to the classical liberals of the late eighteenth century, by and large. “Conservative” is approximately opposite of “liberal” or “progressive” in popular connotation, and since the Democrats had successfully co-opted the term “liberal,” despite being nothing of the sort, they managed to carry off a vast fraud on the American people using a sort of primitive branding that set conservatives against the liberal Democrats and the progressive Republicans. It has been in this approximate form ever since, with the Republicans adopting “moderate” from time to time as a way to escape linkage with the frightful failures of the progressive era. They don’t believe in the supremacy of the individual over the interests of the community. Most conservatives are almost precisely opposite in philosophical leanings to the communitarian front, being Christian individualists in the main. While they certainly work in their communities and contribute to them greatly, they believe in an individualized form of salvation, and an individual responsibility in obtaining it. The communitarians conceive instead a form of “collective salvation.” If that term sounds vaguely familiar to you, it is because your current president has used it too. In this sense, it is fair to say that from Bush the elder, to Barack Obama, we have been on a nonstop course of communitarianism since 1989. They do not believe in the small “r” republicanism of our founders, and they certainly do not believe in the containment of the state, the only discernible difference being their apparent relative positions on the scale between religious and secular intent. To demolish the United States will require demolishing its distinct culture, any sort of nationalistic sentiment among its people, and the broadening of the definitions of citizenship and nationhood. Did you think the Senate’s amnesty bill was just about cheap labor? It is about deconstructing the United States as a sovereign entity responsive to the interests of its inhabitants. Now that brothers George W. and Jeb Bush are openly pushing for the Senate bill in the House, or indeed any bill at all that can be a vehicle for the Senate bill in conference, one should be able to discern quite clearly that more is at stake in the matter than cheap labor for some construction contractors. For those of you who now wonder how any of this pertains to small “r” republicanism, it is so simple as this: Very few of your elected leaders or even your supposed “conservative” spokesmen are interested in the sort of republicanism your founders brought out of deliberations from a sweltering Philadelphia convention. If you wish to discern who are Republicans of the “RINO” construct and who are actual republicans, you need only key on their records of adherence to lowercase “r” republican principles, including primarily their previous adherence to the US constitution and its framers’ intent. Flowery words don’t matter. Professions of faith aren’t enough. Look at their records. Look at their ideas and the principles upon which they rely. If you are constitutional conservatives, you must in the name of all you cherish perfect the ability to recognize the charlatans at a mile’s distance. In Washington DC, and in states’ capitals, Republicans are legion, while actual republicans are few, and it’s a ratio we must reverse. Before this primary season is said and done, you will have learned a good deal from various Republican politicians just how thoroughly they are part and parcel of the GOP establishment. It’s really no surprise, but Hot-Air is now reporting, former Florida governor Jeb Bush will endorse Mitt Romney before the Florida primary. This follows on the heels of news on Thursday that John Bolton is endorsing Mitt Romney. One after the other, these people are revealing who they really are, and what it is they intend. 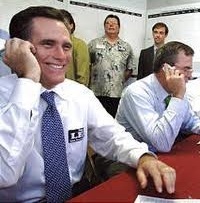 Mitt Romney has become the Bush-clan nominee, and since the Bush family still has so much thorough influence in the party, they’re now leveraging everything they can in the direction of Mitt Romney. Mitt is their kind of conservative, which is to say he’s not conservative at all. The reason for all of this is to dis-spirit and demoralize the base, and to cut off entry to any others. It’s time to shake up this party, and this primary, but I don’t know how to do it from among the current crop of candidates. Worst of all, what you find when you drill down through it is that all of these people are really fellow travelers. The Bush clan’s reach is long, and they have been dominating national Republican politics for more than a generation. This is why the GOP never seems to make any ground against the big-government Democrats, and at times you’d almost believe they’ve been doing it intentionally. You might wonder why all the endorsements from the Bush clan and its allies are coming so fast and furious now, and the answer is actually very simple: It’s their intention to shut down this nominating process before you can rise to oppose Mitt. The GOP establishment is a wholly owned subsidiary of the Bush family, and the implications are clear: They believe they should run the country indefinitely, and they have no intentions to turn away from power. Dominating the GOP directly is the method by which they maintain their power, and they are not conservatives. The Bush clan is communitarian. If you’re unfamiliar with the term, I hope you’ll read up on it, because it describes the philosophical base of the GOP establishment. This is why I view these endorsements as important, because if for no other reason, they tend to show us who the other communitarian politicians are. Watch and count who comes out to endorse Mitt Romney, particularly those who endorse before he has the nomination numerically cinched. If you wish to defeat Barack Obama, you’d better nominate somebody else. Mitt Romney will not get it done, but if you want to see how thoroughly they love power, watch how they’re willing to lose in order to prevent conservatives from gaining power again. They wanted McCain too, and as soon as he had the nomination, they set out to undermine him. What do you think Colin Powell’s last minute endorsement of Barack Obama was really all about? Remember, these people have nothing with respect to liberty at stake, because they’re in a position to avoid the worst aspects of Obamacare, and they will be able to walk past most of the socialist programs with which you’ve been saddled. In short, they don’t care, and they don’t reference such concepts in their thinking. This is how you wind up with the abomination of George W. Bush arguing that he had to “destroy the free market to save it,” with respect to TARP. This is why when they enact their ridiculous Medicare Prescription Drug entitlement, they aren’t worried: They are able to get whatever they want. Now if you think this sounds vaguely like the language of an “Occupier,” let me suggest to you that you’re missing the point. It’s not their wealth I find obnoxious, but their willingness to let your liberties slide away because they have their own wealth. In this sense, the system they are creating is one that will prevent you from joining them in wealth. To read that Jeb Bush will endorse Romney before the Florida primary merely demonstrates the point: They’re intent upon cutting off debate lest you realize the nature of the game and nominate somebody else altogether. My suggestion to you is that you do so anyway. You have nothing to lose by it, and everything to gain if you can frustrate their continuing attempts to dominate our politics.